A study published in the medical journal Acta Pædiatrica reports that birth defect rates in the United States were highest for women conceiving in the spring and summer. The researchers also found that this period of increased risk correlated with increased levels of pesticides in surface water across the country. Studying all 30.1 million births that occurred in the U.S. between 1996 and 2002, the researchers found a strong association between the increased number of birth defects in children of women whose last menstrual period occurred in April, May, June or July and elevated levels of nitrates, atrazine and other pesticides in surface water during the same months. 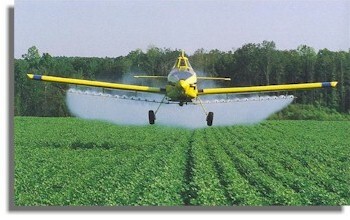 While many of these chemicals, including the herbicide atrazine, which is banned in European countries but permitted in the U.S., are suspected to be harmful to the developing embryo, this is the first study to link their increased seasonal concentration in surface water with the peak in birth defects in infants conceived in the same months. The correlation between the month of last menstrual period and higher rates of birth defects was statistically significant for half of the 22 categories of birth defects reported in a Centers for Disease Control and Prevention database from 1996 to 2002, including spina bifida, cleft lip, clubfoot and Down’s syndrome. “Elevated concentrations of pesticides and other agrochemicals in surface water during April through July coincided with significantly higher risk of birth defects in live births conceived by women whose last menstrual period began in the same months. While our study didn’t prove a cause and effect link, the fact that birth defects and pesticides in surface water peak during the same four months makes us suspect that the two are related,” said Paul Winchester, M.D., Indiana University School of Medicine professor of clinical pediatrics, the lead author of the study. Researchers found a strong association between the increased number of birth defects in children of women whose last menstrual period occurred in April, May, June or July and elevated levels of nitrates, atrazine and other pesticides in surface water during the same months. “Birth defects, which affect about 3 out of 100 newborns in the U.S., are one of the leading causes of infant death. What we are most excited about is that if our suspicions are right and pesticides are contributing to birth defect risk, we can reverse or modify the factors that are causing these lifelong and often very serious medical problems,” said Winchester, a neonatalogist at Riley Hospital for Children. Birth defects are known to be associated with risk factors such as alcohol, smoking, diabetes or advanced age. However, the researchers found that even mothers who didn’t report these risk factors had higher overall birth defect rates for babies conceived from April to July. The study relies on findings by the U.S. Geological Survey, the U.S. Environmental Protection Agency and other agencies on the seasonal variations in nitrates, atrazine and other pesticides in the surface water. “These observations by Dr. Winchester are extremely important, as they raise the question for the first time regarding the potential adverse effect of these commonly used chemicals on pregnancy outcome — the health and well-being of our children,” said James Lemons, M.D., Hugh McK. Landon Professor of Pediatrics at the IU School of Medicine. Lemons is director of the section of neonatal-perinatal medicine at Riley Hospital. Co-authors of this study, which was funded by the Division of Neonatalogy of the Department of Pediatrics of the IU School of Medicine, were Jordan Huskins, B.A., a fourth year I.U. School of Medicine student, and Jun Ying, Ph.D. of the University of Cincinnati. In a related study, it was found that children conceived in summer perform more poorly in school than other children. An Indiana research team has linked poor school results to pesticides and nitrate exposure in the early weeks and months of development. A study of more than 1.5 million children in grades 3 to 10 found that children conceived in the months when pesticide and fertilizer levels were highest achieved significantly lower results in standard math and English tests. “The fetal brain begins developing soon after conception. The pesticides we use to control pests in fields and our homes and the nitrates we use to fertilize crops and even our lawns are at their highest level in the summer,” said lead researcher Dr. Paul Winchester, director of Newborn Intensive Care Services at St. Francis Hospital in Indianapolis. The study supports other evidence that low levels of exposure to toxic chemicals at critical periods of development can have devastating and long lasting effects. To read more articles from the Indiana University School of Medicine, click here. Neurones are at their most vulnerable in the first trimester of pregnancy. The toxic chemicals in the atmosphere are obviously inhaled by the mother and pass the placental barrier and enter into the foetus when it is just developing in the womb.It is clear from the research you have mentioned that neural networks are affected by this onslaught of chemicals. This entry was posted on April 27, 2016 by Vox Populi in Environmentalism, Health and Nutrition and tagged Indiana University School of Medicine, Jordan Huskins, Jun Ying, Paul Winchester, Pesticides In Water Linked To Birth Defects And Developmental Problems, Study Links Birth Defects To Pesticides In Water.